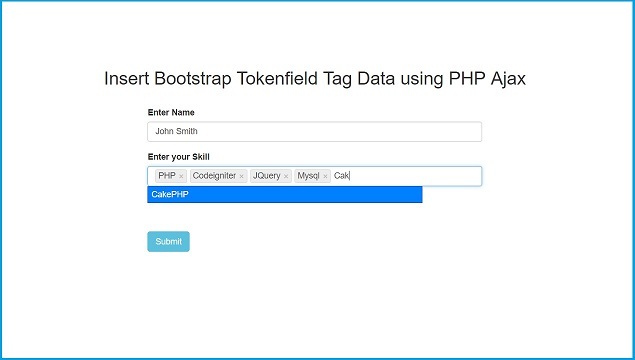 Hi, This is our new post and in this post we will learn how to integrate Bootstrap tokenfield plugin for tag within our system and how to insert that Bootstrap tokenfield data into Mysql table by using PHP script with JQuery Ajax. We all know Tags are used define content in group and organize that content with different part. If you have used wordpress and it has been provies tags option for define content into different group. So here we have also learn something about tag, for make wordpress type tag taxonomy we have use Bootstrap Tokenfield plugin with Jquery UI autocomplete widget. In this post we will applied Bootstrap Tokenfield tags to input type textbox, so when ever user has come for enter his particular data then JQuery UI autocomplete will load pre populated list of stored data and from that list user can select his proper option. After selecting option that data will be converted into stylish tag. We can also remove tag by clicking on remove buttong, every tag has it's own remove button, so we can remove particular tag by clicking on remove button and it will be remove from textbox. So here we will make simple form in which user can enter his or her name and they can also enter his or her skill, while they have come into Skill textbox, then this plugin will activate and load pre populated list of data and user can select proper option. After this we will insert that form data into Mysql table by using Ajax JQuery with PHP. We can enter more than one tag data at time by using this plugin. In table tag data will be stored in string format with every tag will be comma seperated. This all things we have discuss in this post. So, I hope you can something new from this post. Below you can find complete source code and online demo also.